Welcome to the new Tucson Bird Count website! Data entry, resources for surveyor and summaries are located under the Results and Data Entry Tab. Welcome to the Tucson Bird Count! The Tucson Bird Count aims to help people make informed decisions regarding the impacts of human actions on wildlife. Urbanization is a movement that is well established and will continue to grow in the future and one way to reconcile that loss of habitat is to endeavor to share our urban space with native birds and wildlife. Through informed decisions we can all help Tucson sustain a diverse bird community which is good for the birds and also enhances the quality of life for Tucson’s human inhabitants. The Tucson Bird Count is a citizen-science driven effort that has documented how native birds use the habitat within and surrounding Tucson for over a decade. The information gained through this study has allowed informed recommendations on what Tucsonans can do within their yards, neighborhoods and communities to make Tucson a better place for birds. As Tucsonans make changes and efforts to share their city space with native birds, the count effort itself will document how birds respond to all of our efforts to provide habitat for native birds right within our own habitat. 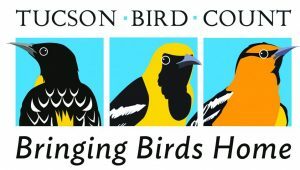 Whether you are helping with the volunteer annual bird counting efforts or enhancing your urban habitat for the benefit of native birds, you are helping make Tucson a better place for birds and for all of us. Thank you. These are the routes that are currently available (2018) and in need of a counter. Each route is a series of multiple points and each route is a different color. Please email Jennie at jmacfarland@tucsonaudubon.org to claim a route. I am doing my best to keep this map current and routes are first come, first served. 107 Central – Campbell from Broadway to River Rd. 124 Central West – West of Silverbell from Ironwood Hill Dr. to Sweetwater Dr.
132 Central West – From Starr Pass and Greasewood to Grant and 1st St.
142 Central South – west of Alvernon from Valencia to 36th St.
156 North East – Houghton from Tanque Verde Rd. to Snyder Rd. 185 South West – Ajo east of Kinney Rd.